In 2015, California saw 25 spills, releasing nearly 200,000 gallons of crude oil and other hazardous liquids. Unfortunately, the trend is continuing in 2016. 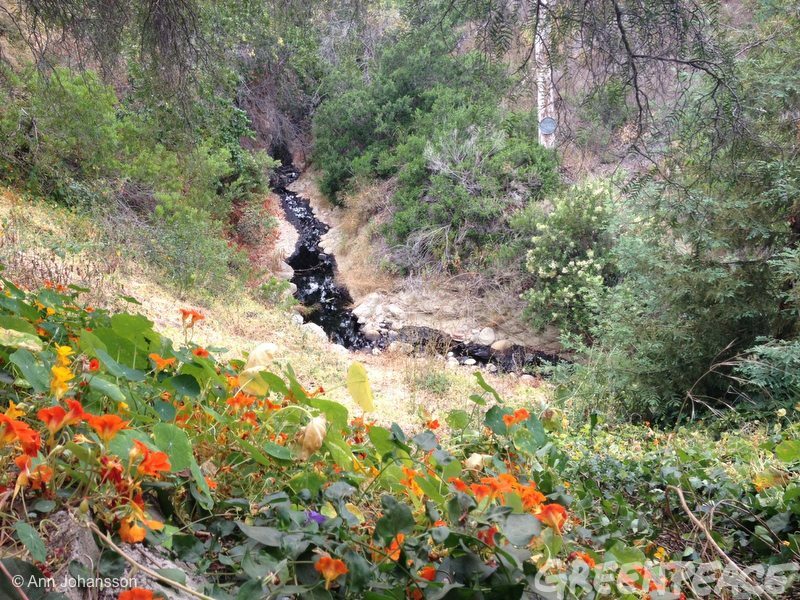 A pipeline that carries oil from Ventura County to the Los Angeles Basin — including to an ExxonMobil refinery — leaked 29,000 gallons on June 24, 2016. The pipeline is operated by Crimson Pipelines LLC, which has been responsible for ten spills in California since 2006. Firefighters in Ventura County, California — just north of Los Angeles — are responding to a roughly 29,000 gallon pipeline leak, the Los Angeles Times reported this morning. Crimson Pipeline LLC, the operator of the pipeline, had originally estimated a 5,000-barrel (210,000-gallon) leak, which was adjusted down to 700 barrels (29,400 gallons) this morning. Officials have not commented on why the estimate was revised, but are on the scene to clean up the spill and were able to prevent the oil from reaching the California coast and more densely populated areas. A spokesperson for Crimson said that the cause of the leak was still under investigation. Resident Kirk Atwater was first to report the spill by calling 911 at 5:35am local time. Atwater told SF Gate that he could hear and smell the flowing crude oil from his home. Residents have since been alerted that they should leave the area if they are sensitive to odors, but no mandatory evacuations have been ordered. 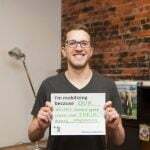 Environmental scientists from the U.S. Fish and Wildlife service and agencies are currently assessing the potential damage to local ecosystems. Oil fills a natural depression in the hills of Ventura County, California. Photo by Ann Johansson / Greenpeace. More photos from the spill and cleanup efforts available here. Following the national trend of under-regulated, unsafe pipeline operators, this is by no means Crimson’s first large spill. According to the Pipeline & Hazardous Materials Safety Administration, the company is responsible for ten leaks, spills, and other incidents in the past ten years, releasing a total of 7,453 barrels (313,000 gallons) of crude oil and other hazardous liquids since 2006. And that’s just in California. Crimson’s smaller Gulf of Mexico affiliate was also responsible for 220 barrels (9,240 gallons) spilled just last year. Together, Crimson’s Gulf and California operations have caused roughly $7.6 million in property damage over the past ten years. But don’t think these mistakes mean officials are keeping their eyes on Crimson. The company’s California branch hasn’t received a federal inspection since 2006. Ventura County firefighters were the first to respond to the spill after receiving a 911 call from a local resident at 5:35am local time. More photos from the spill and cleanup efforts available here. The Crimson spill comes less than a month after a Shell pipeline leaked more than 20,000 gallons into California’s Central Valley, Shell’s second spill in two weeks after it dumped 90,000 gallons into the Gulf of Mexico. And it’s almost exactly one year after California’s largest spill in recent history, along Refugio State Beach in Santa Barbara County. The Santa Barbara spill, also the result of a pipeline leak, poured 143,000 gallons into the Pacific Ocean. Pipeline operator Plains All American Pipeline was indicted this month on 46 criminal counts, including four felony charges, and faces nearly $3 million in fines. And these are only the spills that made the news. 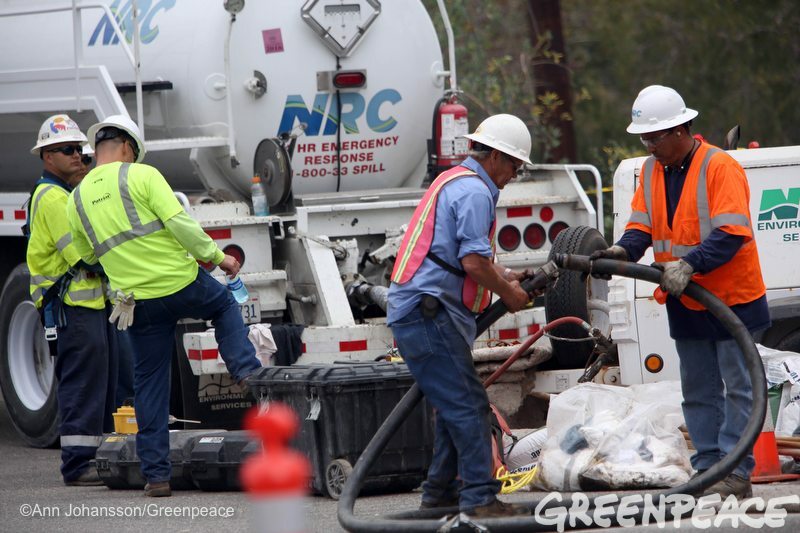 Last year, there were 25 spills in California alone. Together, they released a combined 197,400 gallons of crude oil and other hazardous liquids — 11,000 gallons of which were never cleaned up — and caused $148 million in damages. 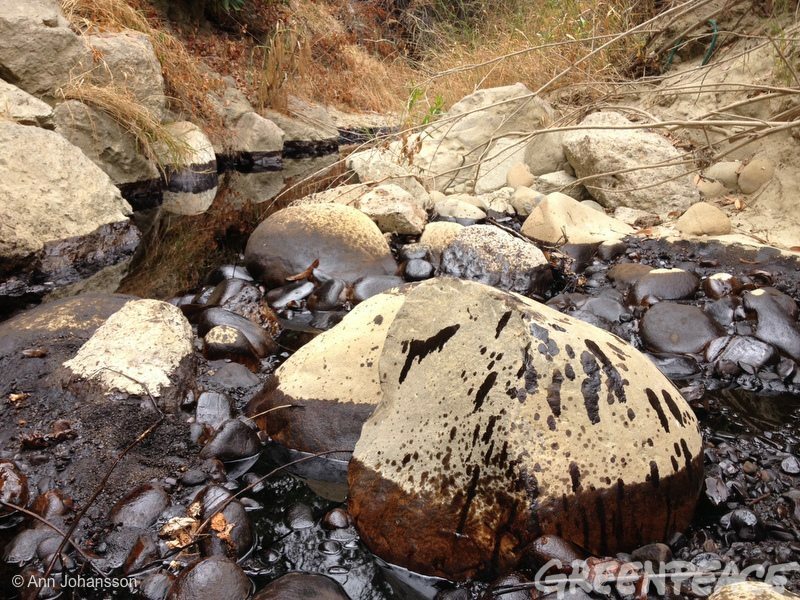 Oil coats rocks in a stream in Ventura County, California, the site of a 29,000-gallon oil spill. Photo by Ann Johansson / Greenpeace. More photos from the spill and cleanup efforts available here. It’s ridiculous that I have a template for writing about oil spills — that’s how often these leaks and spills happen in the United States. It’s time we start treating pipeline spills and failures for what they really are: business as usual for the oil and gas industry. Their PR reps may call this event an “accident,” but when the industry can’t make it through the month without a multi-thousand gallon spill, it’s clear that something has to change. Improved inspection and enforcement of pipeline safety is an immediate must, but it’s only the beginning. 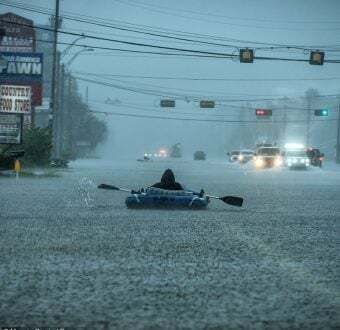 The real goal needs to be a transition away from dirty fuels that bring us disaster after disaster. 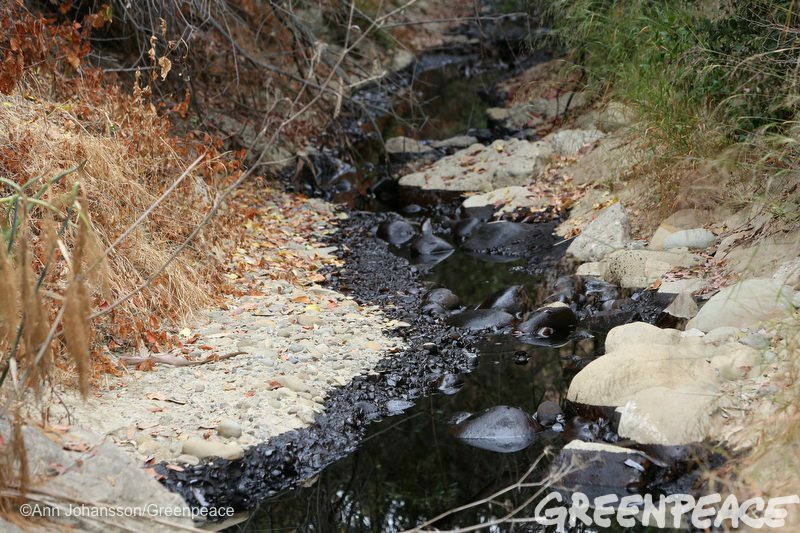 Enough is enough — take action to keep fossil fuels in the ground before ANOTHER devastating spill.